With the Fastbind casemaker series, Casematic H32Pro/H46Pro and Case Express Series, you can now make professional custom printed 3 ring binders along side your custom printed hard covers. Other custom printed cases for CD/DVD's and wire or coil bound book can be made on any of our case making systems. 3 ring binders are an everyday staple for business, but there are market sectors such as engineering and architectural where the presentation of their bid proposals and or documentation requires packaging that matches the value of the content! Just imagine sending in a 1/2 million dollar bid proposal in a common retail 3 ring binder and a single title print slipped into the front. Now imagine a full custom printed 3 ring binder, with the personalized content and graphics enhancing the message and elevating the brand imaging. With the Fastbind Case maker series, you can finally make short run 3 ring custom printed binders in house, on demand! With Fastbind Casematic H46 Pro, you can do much more that just hard covers for books. 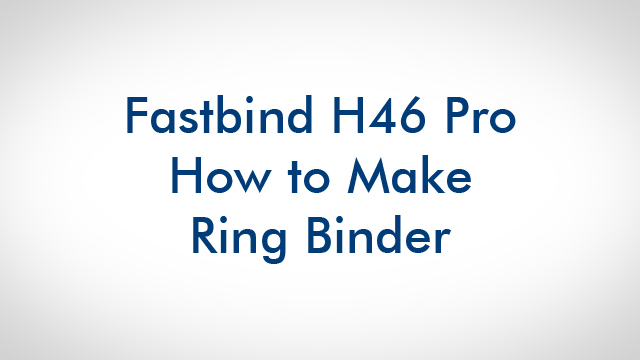 One of the most successful application of the Fastbind case makers, outside of book covers, is the ring binder. You produce the cover, as you would for a book and then also apply a printed adhesive sheet on the inside. Then, just mount the mechanism and your unique binder is ready!